If you have plans to re-décor your home with old-fashioned and rustic look, then these 10 DIY home décor wood projects will inspire you. There is no need of spending huge cash because most of these projects only require unused woods and simple equipment. Now, let’s get crafting! Have you ever found yourself needing more shelves? Then, you can have them with cheap price. What you need to do is just some woods and wood paint. These shelves are called as Pallet Shelves because they are made of wood. You will only need about three hours per shelf to make them. If you want a rustic look, then leave it be and don’t paint it. However, if you want to match the shelves with the atmosphere of your room, you are welcome to paint them on. Rustic looks sometimes will give a country-like atmosphere if you live in a town. If you want to decorate your room with some rustic looks, you can begin it with decorating your photograph’s frames. You can replace the original frames with wooden frames to make them look different and giving the room a rustic look. Even, you can add small satin ribbons to make them prettier. This is a great idea for you who love to hang pictures or photos on the walls. If you ever own an old dresser or cabinet that you can reuse it, you may want to consider to do a makeover on it. Take out the drawers and add some rustic wooden planks. This is a great idea to reuse old or broken dressers and cabinets, so that you don’t have to afford the new ones. You need to attach the wood pieces altogether and fix them, so that they will give you an easy access to the cabinet’s contents. Redone Rustic Cabinet is quite simple to make and the result will be a very handful cabinet. Source. This is a great idea for those who are very fond of having coffee or collecting artistic or antique mugs. Bring a few pieces of wood and some small coat hooks. 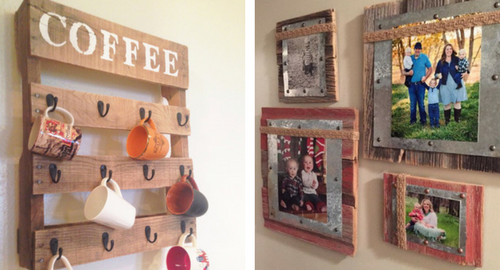 Assemble them together with some nails and now, you have your own Pallet Coffee Cup Holder. Don’t forget to add some decorations and stain it with any color you want. However, if you prefer to have a rustic look of your coffee cup holder, then you may want to stain it with original wooden color. For any of you who love to spend time in front of a mirror, consider to have it beautified. This is a simple project that you can do on your own. You just need some wooden branch, then cut them into slices. Glue them together in a circle or in your mirror’s pattern. This decoration will totally give a change in your room as well as adding a rustic look to your mirror. Now, you probably will be spending more time in front of your mirror because of its attractiveness.